That's it. Pack up the fine china, stock up on tinned soup and start digging a bunker, because this great dance we call humanity is done for. First they play Tetris, then they play Madden, then we all die in a nuclear fire. 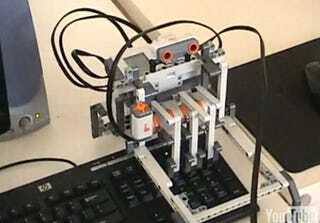 This Tetris-playing robot consists of a camera and a three-fingered robotic hand. Made of LEGO! With the camera it reads the screen, and with the hands, it moves the keys. Simple, and yet still impressive! Only thing it's missing is the Tetris song. So below, the Tetris song.